Watford striker, Odion Ighalo has admitted that it will be painful to watch the 2017 Africa Cup of Nations on television. The Super Eagles failed to qualify for the tournament, which will be held in Gabon from January 14 to February 5, after finishing second behind Egypt in their qualifying group. 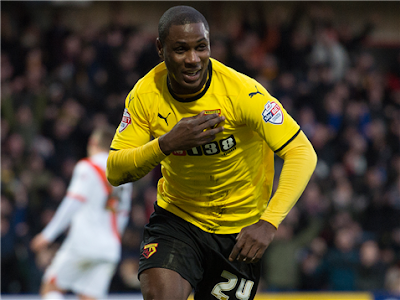 “I felt bad – not just me but Nigerians as a whole are not happy,” Ighalo told BBC Sport. “Seeing teams playing in the Nations Cup and you see yourself at home you know you’re not going to the Nations Cup that’s when I am going to feel bad”, he added. Ighalo, however, said the former African champions will have to put the disappointment behind them and focus on the next edition in 2019. “You know you don’t have to dwell on that, we don’t have to kill ourselves about that. “We have to work towards the next one and keep pushing. Hopefully we will qualify”, he added.